Cook spaghetti to desired doneness as directed on package. Drain; cover to keep warm. Sprinkle chicken evenly with garlic-pepper blend. Spray large nonstick skillet with nonstick cooking spray. Heat over medium-high heat until hot. Add chicken; cover and cook 4 to 5 minutes on each side or until browned, fork-tender and juices run clear. Remove chicken from skillet; cover to keep warm. Add roasted pepper mixture to skillet; cook over medium heat until thickened, stirring constantly. Stir in oil. 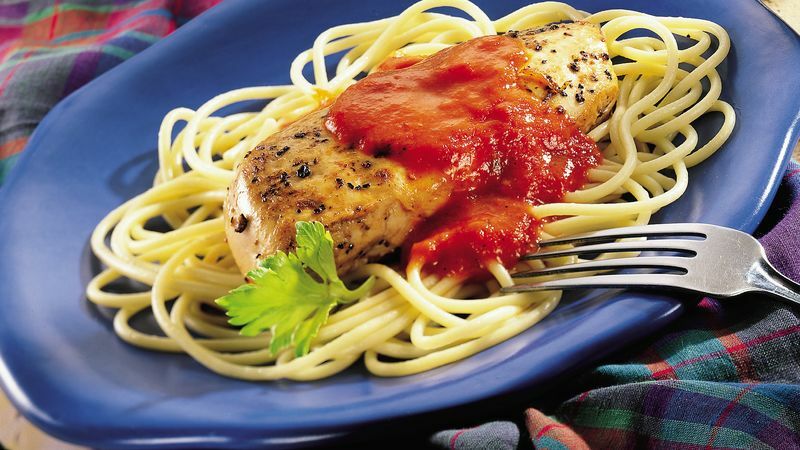 Serve sauce over chicken and spaghetti. Sprinkle each serving of this pasta dish with freshly grated Parmesan cheese, then add a fresh basil leaf or chopped fresh parsley. Steamed broccoli florets are a colorful and nutritious accompaniment to this pasta recipe.